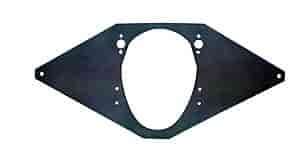 Competition Engineering Front Motor Plates provide a solid connection between your engine and chassis. The installation of a front motor plate eliminates twisting of the chassis caused by engine torque and ensures that the power gets to the rear wheels. They're perfect for engine swaps or for setting the motor back in the chassis for increased weight transfer. Made from 1/4'' Thick 6061-T6 Aluminum. Computer Designed and Machined for Accuracy. Improves Reaction Time and 60-Foot Times.